Portable 2-Bar Tire Cage up to 455/55R 22.5 Ken Tool T101 /BOWES KT T101. 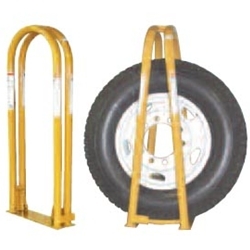 Especially designed for wide base tires, this portable inflation cage will hold super singles, and super wide radial tires. Fits comparable tires up to: 455/55R 22.5 Wide Super Single.